It’s day three of my 30-day series dedicated to brave and brilliant female poets.Today’s poet is Akiko Yosano, who was born in December 1878 near Osaka, Japan. 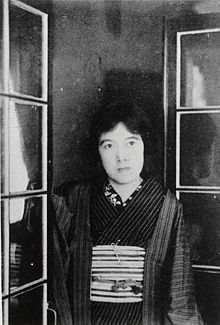 Yosano was her pen name, and she was born Shō Hō, but changed her name after she had begun to write about more controversial topics, such as pacifism, feminism and individualism, which was frowned upon and dismissed by her contemporaries as frivolous and too political for a woman poet and writer. Her strong female characters who controlled their own destinies were not typical of other female characters written at the time. She was famously prolific and wrote up to 50,000 poems in her lifetime. Her style is romantic and sentimental, but was widely seen as controversial at the time. This poem is particularly vivid and relates her style of ornamental repetition and her ability to connect placement of things and memory directly to her feelings of romantic love. From a thin, skinny glass.